Market Manila - Home Made Corned Beef - Beef/Lamb, etc. I absolutely love corned beef in almost all its forms — from traditional kosher preparations that end up thinly sliced in towering deli-style corned beef sandwiches, or in a corned beef and cabbage (and potatoes) incarnation, or my “dirty” culinary must-have, highly processed and colored and preservative laden canned corned beef from South America enjoyed with what else, but lots of Heinz tomato ketchup! :) But I have never attempted to make it from scratch, until a few weeks ago… and while the results were perhaps just a 7 out of 10 on the MM self-rated scale, it is definitely something I plan on trying again. But first, what gives with the strange name? To “corn” something means to marinate it in salt (little grains of salt are also referred to as corns of salt) and it stems from centuries ago when one killed a ginormous cow, then somehow had to preserve the meat that wasn’t consumed all at once. So salted beef was born. In the decades and centuries since, saltpeter or curing salts were added to prevent bacterial growth, and this gave the beef the characteristically pink tinge we now associate with corned beef. But I also suspect commercial corned beef these days is also dealt a heavy dose of red food coloring to avoid the pallid and sometimes unappetizing grayish hue of a homemade all natural corned beef. 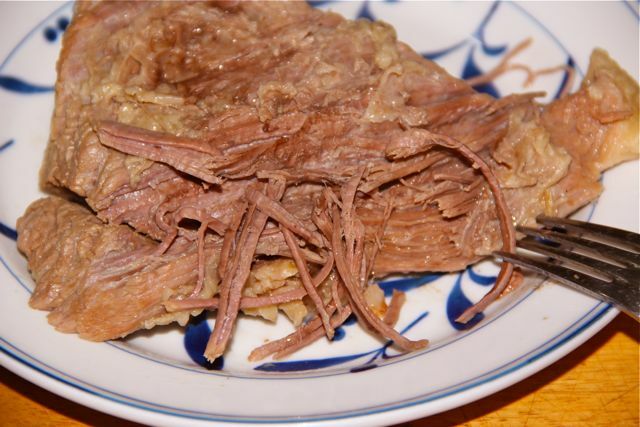 I used this popular on-line recipe for corned beef by Alton Brown. I was a few spices shy, particularly the allspice and juniper berries (I only had half the amount he called for) so the beef wasn’t as flavored as it should have been. Also, I must have used more liquid than he did, as the saltiness factor was a bit low for me, though Mrs. MM thought it was salted just enough. 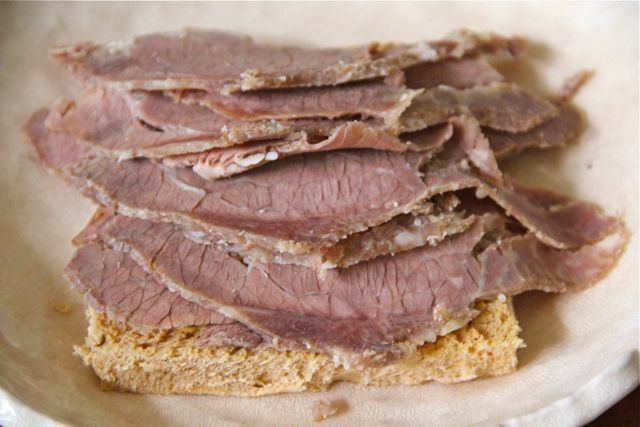 A lot of commercial corned beef can be oversalted and they hope that the cooking process, where the beef is boiled for hours until tender, will remove a lot of the salt. Basically, this recipe is incredibly easy to do. 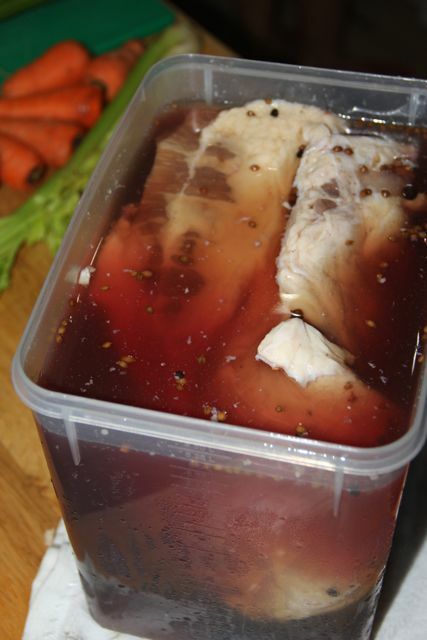 Just get a huge hunk of beef brisket (I used an Australian cut of brisket which happened to be incredibly fatty and had more connective tissues than is most desirable), place it in a cooled salty, flavored brine solution, and let it sit in the fridge for 10 days, turning the meat every day or so. 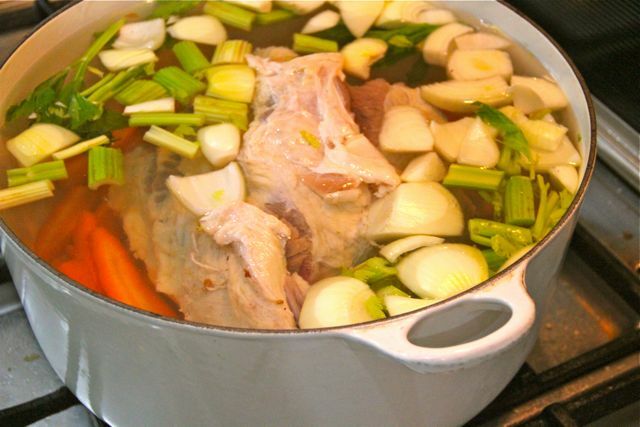 After the brining process is done, boil the beef with some carrots celery and onions for 2-3 hours until tender, remove from the water and let it rest, and voila! you have corned beef! You can shred the meat with forks or slice it thinly like they do at good delicatessens. It’s good freshly made and hot, along with potatoes and cabbage. Or cold and sliced into sandwich filling. Or re-purposed into corned beef hash. Thank you for the recipe. I’ll do it tomorrow. Gee, I just came across a meat injector gun and thought Market Man and what do you know, a post about curing meat. 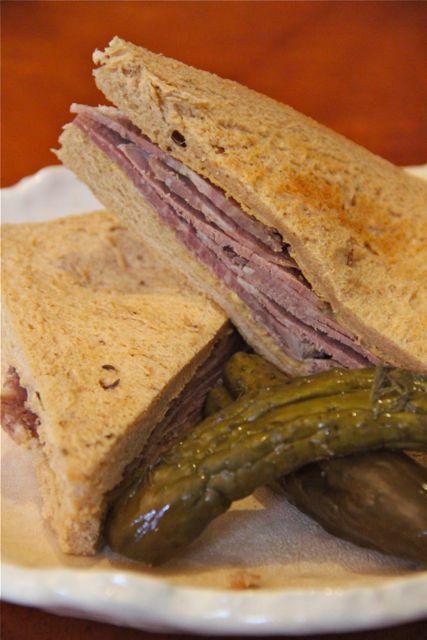 Up here in Canada, we are more familiar with the region-specific variation called Montreal smoked meat. It is distinct in the way that Montreal bagels are different from say, New York bagels. The way they sandwich heaps of it between rye bread here will tempt you to emulate Lee to make additional normal sandwiches out of the copious filling. Corned beef and cabbage is one of my favorites and a sister-in-law always makes it a point to serve it when I’m visiting. Funny (odd), cabbage rolls can propel me like a rocket but corned beef and cabbage leaves me well disposed and safe company even in close quarters. one of my all-time favorites. yes, use all of the praque powder for a nice color, and so you’re sure the meat does not spoil during its term in the fridge. . i use a pressure cooker for this (45 mins. to 1 hour) on low heat so the meat does not shrink all that much. among the local canned corned beef, my family loves delimondo. and when i cook corned beef and cabbage, i sometimes make it soupier and drop a cube or two of S&B japanese curry. it’s a yummy variation. Definitely going to do this next weekend! Thanks MM! Just about any butcher here in Australia sells corned beef, as well as corned pork and even sometimes corned mutton, which is my favourite of the three. They have special equipment for the brining. As you say, it’s a bit of a pain to get the ingredients to make at home. Hopefully it will become more widely available in The Philippines in supermarkets. Pickled pork should be very popular. I always thought ‘corned beef’ meant it had corn in it. Just as pork and beans had pork years ago. Corned beef with cabbage and a little corn is always a winner. We make lots of it for meals and later on for snack with pandesal with butter. Hi MM, I was wondering if prague powder or curing salt is easily available in supermarkets here in metro manila, or do I have to buy it somewhere specific? Market Man, where can I find decent beef brisket in Manila? I tried making the canned version of corned beef from scratch before. Mine turned out a bit salty but I loved how it looked like canned corned beef. But I don’t know how they make the meat finer, since mine looked overly chunky compared to the canned version. I tried the Alton Brown recipe the first time (he is my fave chef) but got turned off since it was the sliced version of corned beef. The first time my mom made corned beef I had no clue you can make corned beef. It was absolutely delicious! But of course in my mom’s generation almost everything was made from scratch…longganisa, tapa, ice cream, ice candy, jams, jellies, atchara, etc. I was 12 when I learned to bake from her….chiffon cake, pandesal that never tasted as the store bought ones. Later on I took over baking cookies for Christmas…fig bars, peanut butter and oatmeal cookies every christmas. Cheska, prague powder from specialty ingredients stores, I got some in Cebu, but I have seen it at some bake/food stores in Manila. I recently got some Prague Powder/Curing Salt at the Landmark Trinoma grocery store. It’s located in the spice section beside the McCormick pouch seasoning mixes. Its made by a local brand, J something, maroon colored packaging and the powder is colored pink so you should be able to see it immediately. It’s about 18 pesos per pack I think. As for the Juniper Berries, I heard that a store located in Market Market that specializes in bottled Herb and Spices carry them. Personally I haven’t been there so I cant attest if they do have them. Could be worth a try if you’re in the area anyway. I was planning to make homemade coned beef for the longest time. Thanks MM for the post reminding me to try this once and for all. :) I would definitely use this for the sinigang na corned beef. I followed the recipe in Leite’s Culinaria and found it tough to complete the spice list. I was down to juniper berries and allspice berries and found these last two in Konbini store on Connecticut St. It may be cheaper to get the pickling spice directly rather than buy large volumes of different spices. Proud to say I completed that spice list haha, even if I found the picking spice later. I have tried making this myself once a couple months ago, used beef short ribs instead of brisket. The recipe I used called for pink salt but unfortunately I could not find it at that time. I love matching this with cabbage and potatoes boiled in the same broth the beef was boiled in. Came across juniper berries in the stall selling spices and nuts beside sm makati grocery just a few days ago. I was looking for whole cloves. Did not find any.